Bullfrog Pool Tile Cleaning removed the white calcium ring off our Pebble-Tec pool and WOW what a difference, our pool looked New Again! I will be recommending this professional company to all of our friends and family. Nice Job Bullfrog! 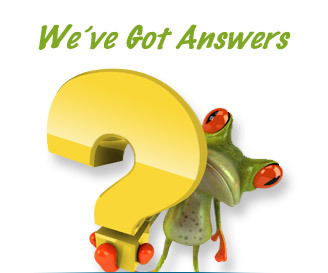 Thank you for visiting the Bullfrog Pool Tile Cleaning FAQ's page. We've included some of our customers most frequently asked pool tile cleaning, pebble-tec cleaning, pool acid wash & pool draining questions. We hope you'll find this forum to be a helpful resource and look forward to answering any further questions; We'd love to hear from you! How does Pool Tile Cleaning work? Because cleaning pool tile can be extremely delicate, we use compressed air to gently apply a soft, mineral based, non-toxic, eco-friendly cleaning media that's been specifically designed for cleaning pool tile. This product, unlike Glass Bead, safely cleans pool tile and removes pool tile calcium, algae and staining from your pool tile surface without ever causing damage. – We Guarantee It! How does Pebble-Tec Cleaning work? Pebble-tec cleaning and Water Feature cleaning uses compressed air to apply various non-toxic, eco-friendly cleaning medias designed to safely remove pool calcium and clean pool algae from pebble-tec, rock, stone, brick, and flagstone with Amazing Results. – We Guarantee It! How does Pool Acid Wash & Pool Draining work? Overtime, the water in your pool may become saturated with hard water solids that can lead to pool tile waterline calcium buildup and interior pool plaster staining and pool pebble-tec staining. Bullfrog's Pool Acid Wash & Pool Draining service removes those harmful contaminates by draining your pool water and applying an acid cleaning solution designed to brighten and sanitize your pools interior while removing most surface staining. This is a great, economical solution to make your pool look new again! How often should I have my Pool Acid Washed & Pool Drained? Because of the Valley's hard water and high summer pool evaporation, we recommended you drain and acid wash your pool every two to four years to help remove excess calcium, algae and other contaminates that may lead to interior pool staining and that unsightly white ring on your pool tile and pebble-tec surface. Does my pool need to be drained before cleaning pool tile or cleaning pebble-tec? No! - We lower your pool water just enough to expose all the pool tile calcium and pebble-tec calcium. In an effort to conserve water, We Never Need to Drain Your Pool. In fact, we usually only need to remove 3 to 4 inches of water to perform our pool cleaning service. Is there a difference between Phoenix pool tile cleaning companies? Yes! – Pool tile cleaning companies vary drastically in their quality of equipment, customer service & warranty and pool tile cleaning techniques. It is extremely important to do your homework before choosing an Arizona pool tile cleaning company and understand that at Bullfrog Pool Tile Cleaning, we don't use toxic chemicals, harsh pumice stone and especially – NO GLASS BEAD BLASTING on pool tile! Our work is 100% guaranteed never to damage your pools surface. 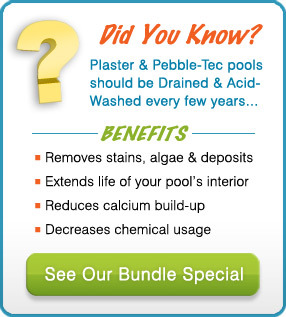 See Our Process page for our complete pool tile cleaning and pebble-tec cleaning methods. What kind of pool tile cleaning products does Bullfrog use to clean pool tile and clean pebble-tec? We exclusively use a soft, mineral-based cleaning media (Kieserite) specifically designed and guaranteed to clean pool tile without damage and NEVER USE GLASS BEAD on pool tile. Even though this pool tile cleaning product is more expensive then other cleaning agents – Bullfrog Pool Tile Cleaning is proud to offer it to our customers at No Additional Cost! 100% Non Hazardous – Safe for Family, Pets, Plants. Can Bullfrog Pool Tile Cleaning clean surfaces other than pool tile? YES! We are proud to clean pool tile, clean pebble-tec, fountains, spillways, flagstone, water features, natural stone, rock and brick. We also provide Pool Acid Wash & Pool Draining Services for all plaster and pebble-tec pools, all with Amazing Results! 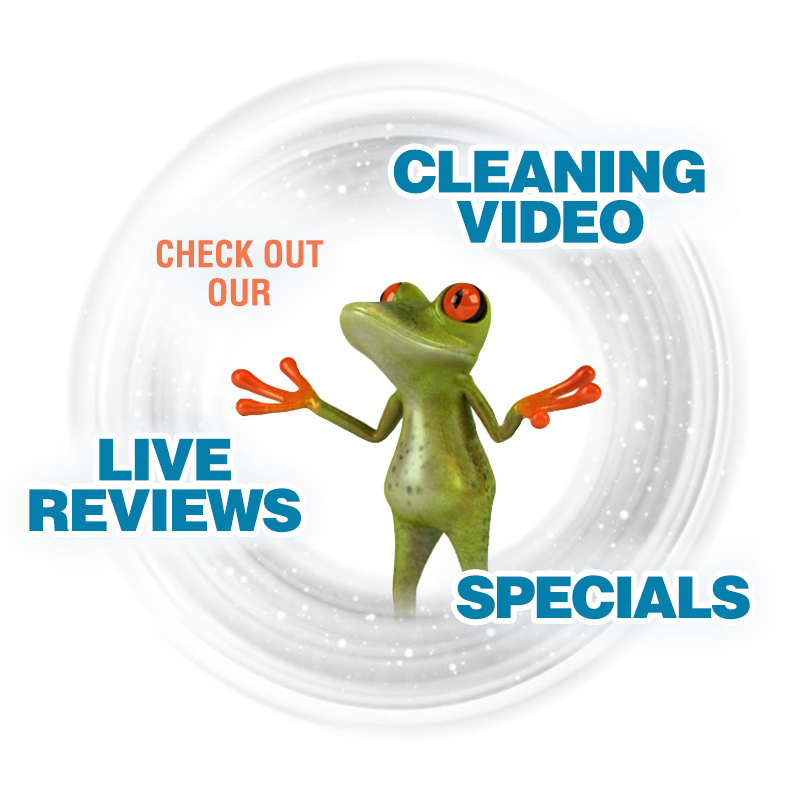 If it has stains or calcium, Bullfrog can clean it! Please visit our Gallery for actual before and after pictures of our work. How long will my pool tile or pebble-tec stay clean after my service? After your pool calcium removal service, your technician will offer to seal your pool tile and pebble-tec to help slow the return of pool calcium. The best way to reduce pool calcium buildup is allow Bullfrog to change your swimming pool water every 2 to 4 years, and correctly maintain your pools chemicals. However, once you're a customer of Bullfrog Pool Tile Cleaning, we'll offer you special customer discount incentives through our "Customer Loyalty Program" so you'll never have to worry about unsightly pool calcium again. Does someone have to be home during my pool cleaning service? No, all we need to complete your pool calcium removal service is access to your pool, spa or water feature. When will I be able to swim after my pool tile calcium removal service? Because the cleaning media that Bullfrog Pool Tile Cleaning uses is non-toxic, eco-friendly and non-hazardous, you can Swim Immediately after your swimming pool tile cleaning service is complete. We'd Love to Hear from You! If you have additional questions about your specific pool calcium removal needs, please Contact Bullfrog Pool Tile Cleaning – Arizona's most trusted pool tile cleaning company.